Polyacrylamide emulsion is a new polymer material made of acrylamide through special process polymerization since 1960s. The polyacrylamide emulsion is by a polymerization reaction in which a water-soluble monomer (acrylamide) is dissolved in an aqueous phase and dispersed in a non-polar liquid by means of an emulsifier to form a water-in-oil type emulsion. Inverse Emulsion Polymerization is a way that water-soluble monomer has the same high polymerization rate and high molecular weight as conventional emulsion polymerization. This could enables efficient polymerization of water-soluble monomers into a milky polymer and the reaction temperature is smooth and easy to control which could reduce the cross-linking and branching reaction. The product molecular weight can be free to adjust and is conducive to the application. The drag reduction agent is the most important component in the slick water fracturing fluid system. When the polyacrylamide emulsion is used as the drag reducing agent for fracturing, the dispersing performance, drag reduction performance and biological toxicity should be considered. The rate of dissolution of the drag reducing agent can be characterized by its dispersion time in the solvent, which the time is required for the polyacrylamide emulsion drag reducing agent to completely dissolve and the theoretical viscosity of the polymer molecule fully developed. The use of shear rate similar to the principle of simulation of site fracturing construction, calculate the drag reduction agent of the drag reduction rate of about 65%. The use of bright luminous bacteria for the test strains, the use of sensitive photometer measuring point drag reduction agent solution on the ability of luminous bacteria to evaluate its biological toxicity size. 1. The traditional gel fracturing fluid system using a higher concentration of gel. The gel of the residue and the cake in the fracturing process will lead to the formation of the cake and reduce the fracture conductivity. The slick water fracturing fluid contains only a small amount of drag reducing agent and other additives, and easy to re-row, which will greatly reduce the formation and crack damage. 2. The amount of chemical additives and proppant in slick water fracturing fluid is less relatively which can save construction costs 40% to 60%. Due to the reduced cost, many of the original reservoirs without commercial exploitation turned to be worthy developing. 3. Drag the water can produce a higher volume of complex fractures of the network. This is due to the lower viscosity of the drag reduction water and the higher pumping rate during construction. Increased fracture complexity and volume increase the effective yield of the reservoir, resulting in increased production. 4. Due to less drag reduction additives in the water content, this application is more clean and easier to use. In recent years, the exploitation of shale gas has been paid more and more attention in China. 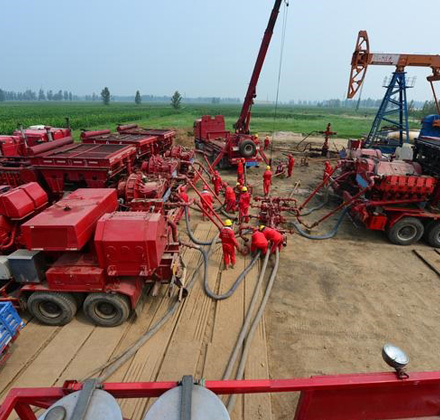 As a key technology for shale gas volume transformation in North America, slick water fracturing fluid has a wide application in China.